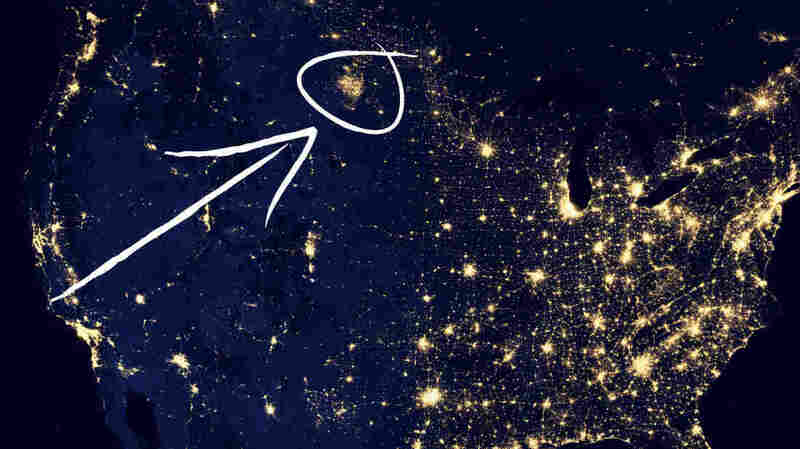 A Mysterious Patch Of Light Shows Up In The North Dakota Dark : Krulwich Wonders... 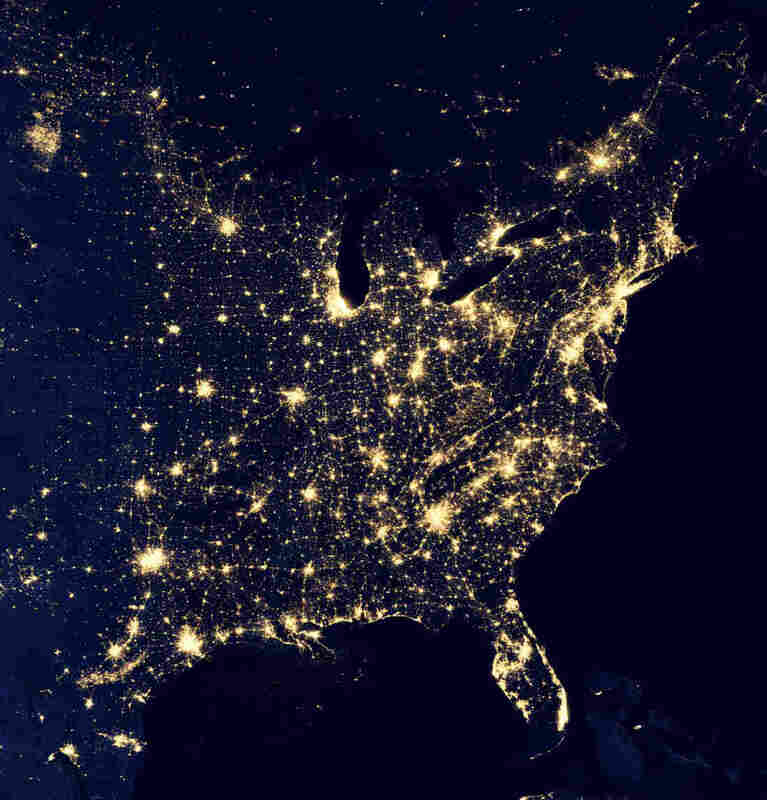 If you are up in space looking down on America west of the Mississippi, one of the brightest patches of light at night is on the Great Plains in North Dakota. It's not a city, not a town, not a military installation. What is it? This is odd. Take a look at this map of America at night. 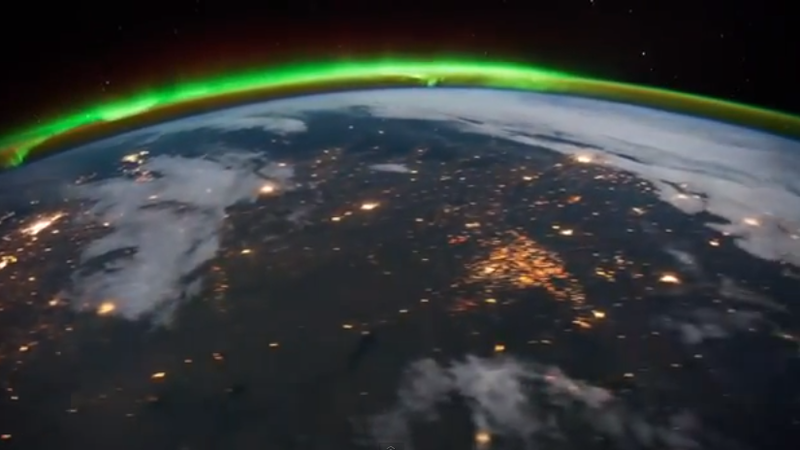 As you'd expect, the cities are ablaze, the Great Lakes and the oceans dark, but if you look at the center, where the Eastern lights give way to the empty Western plains, there's a mysterious clump of light there that makes me wonder. It's a little to the left, high up near the Canadian border. 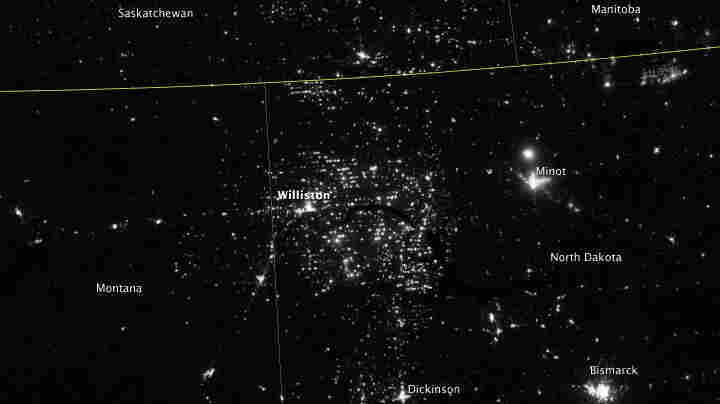 Just run your eye up that line of lights at the center of the country, look over to the upper left: There's a patch that looks like a big city — but there is no big city in that part of North Dakota. There's mostly grass. So what are those lights doing there? What is that? If you need help, here's the same map again; this time, the patch is marked with a circle. It turns out, yes, that's not a city. And those lights weren't there six years ago. What we have here is an immense and startlingly new oil and gas field — nighttime evidence of an oil boom created by a technology called fracking. Those lights are rigs, hundreds of them, lit at night, or fiery flares of natural gas. One hundred fifty oil companies, big ones, little ones, wildcatters, have flooded this region, drilling up to eight new wells every day on what is called the Bakken formation. Altogether, they are now producing 660,000 barrels a day — double the output two years ago — so that in no time at all, North Dakota is now the second-largest oil producing state in America. Only Texas produces more, and those lights are a sign that this region is now on fire ... to a disturbing degree. Literally. Six years ago, this region was close to empty. The few ranchers who lived here produced wheat, alfalfa, oats and corn. The U.S. Geological Survey knew there were oil deposits underground, but deep down, 2 miles below the surface. It wasn't till this century that the industry developed a way to pull that oil to the surface at a cost that made it practical. Fracking, as you probably know, means pumping water and chemicals down pipes, fracturing the rock, releasing the oil. The technology is hugely controversial, in part because of those lights. When oil comes to the surface, it often brings natural gas with it, and according to North Dakota's Department of Mineral Resources, 29 percent of the natural gas now extracted in North Dakota is flared off. Gas isn't as profitable as oil, and the energy companies don't always build the pipes or systems to carry it away. For a year (with extensions), North Dakota allows drillers to burn gas, just let it flare. There are now so many gas wells burning fires in the North Dakota night, the fracking fields can be seen from deep space. In this recent, NASA-produced round-the-world satellite photo nighttime tour of the Earth, you can clearly see the Dakota fields blazing in the grasslands as North America rolls by. No wonder locals are calling North Dakota "Kuwait on the Prairie." On the other hand, says Peter Lehner, blogger for the Natural Resources Defense Council, every day drillers in North Dakota "burn off enough gas to heat half a million homes." North Dakota law says that flares are subject to taxes and royalties after one year, even if the gas isn't being sold. But critics suspect that the state keeps granting exceptions. And state regulators seem less than energetic when farmers call to complain about poisons in the air and water. Many farmers in North Dakota can't prevent drillers from drilling — even if they'd like to. Decades ago, the rights to the minerals below those farms were separated from the rights to the land itself — which is why today, energy companies can move in, create drilling pads where they please, move in trucks and workers, without the farmers' consent. In some places, North Dakota feels like Texas in the early 20th century, when cattlemen fought the oil men. This time it's corn folks versus oil folks. Tempers are rising. Gas is burning. Drillers are drilling. And North Dakota, on some nights, is almost as bright as the aurora borealis. Looking down from the International Space Station, those lights are the North Dakota oil fields. The green arch, of course, is the aurora.